An uninsured driver who killed a pedestrian and badly injured his son has been jailed for a year. Alan Schofield was pushing a trailer along the edge of the A6071 near Irthington in Cumbria with his son when he was struck by her Volkswagen Golf in November 2016. The 57-year-old died at the scene. 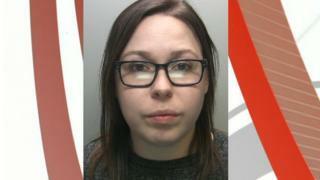 Chelsea McLeish, 26, from Bellsfield, Longtown, appeared at Carlisle Crown Court and admitted causing death by careless driving. She also pleaded guilty to one charge of driving while uninsured. The court was told she was driving "at a minimum of 62mph" on the 60mph stretch of road, was "momentarily distracted" at the time and did not see the two men. McLeish, who was transporting her young daughter, had a previous conviction for mobile phone use behind the wheel. Judge James Adkin jailed her for a year, ordered her to serve a three-year driving ban when released, and take an extended retest. He said: "You should have been paying careful attention to what you were doing, because even the slightest inattention at 60mph can have devastating consequences, as this case so tragically shows."